NSW Premier Mike Baird together with Charter Hall Group and Western Sydney University today officially marked the completion of construction of One Parramatta Square (1PSQ), the $220.5 million commercial development in Sydney’s west. 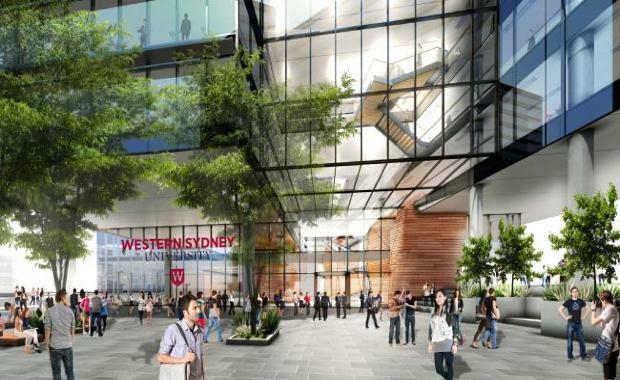 Upon completion the building will be the flagship Parramatta City Campus for the Western Sydney University. The $220.5 million western Sydney commercial development is a part of the $2 billion Parramatta Square urban renewal project. Mr Baird was joined by WSU Vice-Chancellor, Professor Barney Glover, and Charter Hall’s Head of Office Development, Andrew Borger, to mark the momentous occasion. “It’s all happening here (Parramatta) and that’s exciting,” Mr Baird said to The Daily Telegraph. “Barney Glover had a vision that Western Sydney University would have something that was here in Parramatta, that was a showpiece not just for the state or country but for the world. As you can see that is starting to take shape. "The new building will comprise approximately 26,500 sqm of commercial office space across 14 floors, with WSU committing to the entire building on a 15 year lease. The building is centrally located on the corner of Smith and Macquarie Streets within City of Parramatta’s greater Parramatta Square Masterplan, a strategic three hectare redevelopment in the city’s CBD.